What am I talking about? The Bible, the Christian scriptures. Some people treat the Bible as if it was the fourth member of the Godhead. Sometimes, it seems we are more zealous to defend a notion of what the Bible is than we are for God’s glory, God’s reputation in the world. I think many view the Bible as a book of rules. Do these things and you will go to heaven. Don’t do these things and God will get you. Let the people into our community who keep the rules. Exclude the ones who don’t. Study hard so you know the rules. If you are creative, figure out ways to extend the rules to every situation, even ones never envisioned by the rules. Exclude those who don’t agree with your creative interpretations. Congratulate yourself on your diligence in study and rule-keeping. You are one of God’s star pupils. Of course, that is only good if you are good at study and rule-keeping and many of us are honest enough to admit that we are not. So, should we just pack it in since we are in a mess with God anyway? I think that is how a number of people feel. You study the Scriptures diligently because you think that in them you have eternal life.These are the very Scriptures that testify about me, yet you refuse to come to me to have life. Jesus is proposing that the Bible is neither God nor a rule book but rather testimony about himself that can be trusted. The central idea of the Bible is to help people find life through trusting and following Jesus. The Pharisees, who were great at battling for the Bible and devising ingenious rule-keeping strategies were missing the point. In fact they were so caught up in these things that they were refusing something better, real life, being connected to the God who made them through his Son who had come to them. But, you say, there really are a lot of rules in the Bible. It sure looks like a rule book in places. What’s that all about? There are two ways to answer this. One is that the rules really reflect what God is like and what we need to be like to live with Him. They tell us we need God to do something both to wipe the slate clean from all the ways we break the rules, and to deal with our propensity to do the opposite of what God wants for us. That something is Jesus and the life he gives means both forgiveness for what we’ve done and the power to increasingly live differently. The second answer is that the instructions and commands we find, especially those given by Jesus and in the New Testament are not rules but tell us how we might most faithfully and joyfully enter into the life Jesus has for us. They teach us how to love God and each other and to experience wholeness in our own selves. There’s a good deal more that can be said about all this so if you have questions, leave them in the comments and let’s talk! The real deal that I want to come back to is that the most important thing to look for when reading the Bible is how it points us toward Jesus. Earlier in the passage we see this is the Jesus who claims equality with the Father and to have been entrusted with the Father’s authority both to give life and to judge (verses 19-27). If that’s true, then there is no one more important to know! So, if you are spiritually seeking, then it seems one of the most important questions you can ask as you read the Bible is, how does this testify to Jesus and what is this telling me about him? In some sense, all of the Bible does this, but I would suggest for newbie Bible readers that the gospels do this most clearly. And for those who are Christ-followers, how are we viewing the Bible? Have we gotten caught up in some form of Bible wars? Are we congratulating ourselves on how well we keep the rules, or how much we know about the Bible? Or are we not paying much attention at all to what it says, depending on sermons to do that for us? What John says is that this book tells us who Jesus is and how we can find abundant life as we get to know and follow him better and better. 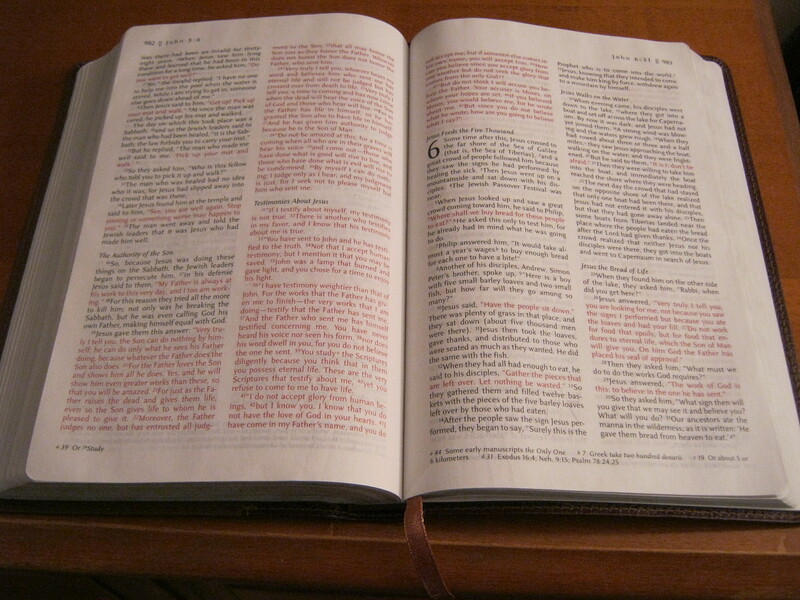 Going Deeper Question: How do you think about the Bible, and how are you interacting with it?